Amphenol is a global interconnect specialist; a world leader in the design, manufacture and supply of high-performance interconnect systems. Among its key markets are military and aerospace, requiring the ultimate in quality and reliability for safety-critical and harsh environment applications. The company already utilised Mecmesin products, however the load capacity of Amphenol’s in-house equipment was such that components with pull-off forces greater than 5 kN had to be sub-contracted out for testing. 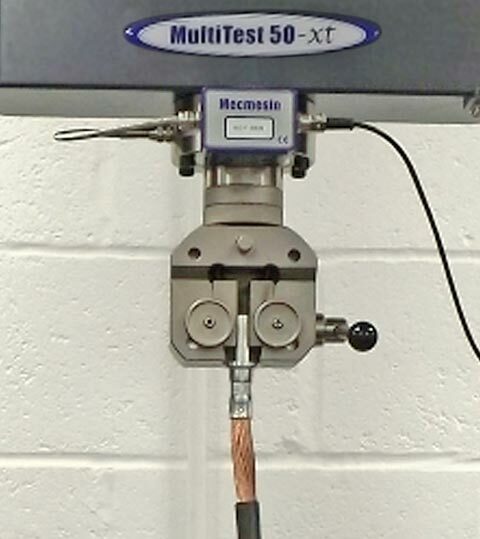 To enable the tensile strength testing of larger contacts internally at its UK site, a tensometer system capable of measuring higher loads was needed. 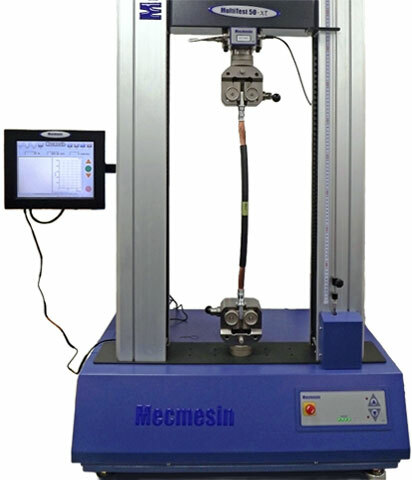 Mecmesin supplied a twin column universal testing machine, rated to 50 kN, with three interchangeable loadcells matched to the expected peak forces in a range of Amphenol’s connector product lines. Measurement accuracy is optimised where the recorded value is close to the full-scale capacity of the loadcell. The main test standards followed are MIL-DTL-22520 and DEF-STAN 59-71, where crimp samples are tested to destruction, either as a means of calibrating the manufacturing crimp tools, or to gather data for developing new connector product ranges. Appropriate gripping is vital to secure the joint and allow the crimped contact to be freely pulled from the cable. The MultiTest 50-xt UTM is operated via a clear and easy-to-use touch screen interface, with software control to ensure that the test procedure is performed with reproducibility and repeatability. The motorised test stand guarantees that constant speed is able to be applied, as per the MIL standard. The modern, intuitive, programming ability enables calculations to be performed on the test data, to return essential information regarding the performance of the connector. The screen also gives and clear, immediate, display of the force profile graphs—providing valuable insight into the crimp’s failure modes and behaviour. Investment in the capability to perform high force tensile strength testing of crimp joints in-house has enabled Amphenol to reduce costs and improve testing turnaround, further demonstrating the company’s commitment to engineering and service excellence.